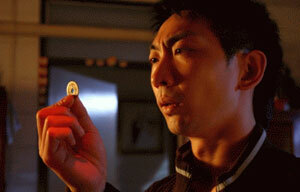 (left) Elanne Kong and her axe, and (right) Sam Lee and his coin in Scare 2 Die. The Skinny: Pang Brothers produced horror-comedy has good tension and decent scares, but its lack of story or familiar emotions render it a throwaway excercise in horror film technique. Not bad, but not essential either. Another horror piece with Pang Brother paws on it, scare 2 die serves up effective technique and atmosphere without much logic or lasting impact to distract. Danny Pang produced this effort, which boasts the debut of director Cub Chien, a longtime assistant director of the Pang Brothers. Chien seems to be concerned mainly with the editing and visuals in scare 2 die, eschewing anything that would qualify this as an actual story. The result is a horror-comedy that's not really quality, but isn't bottom of the barrel either, as it possesses some effective frights and some nifty cultural detail that take it beyond your usual "kids misbehave and then bump into ghosts" flicks that pass for horror films in Hong Kong. scare 2 die is separated into three stories, all interrelated but not in a substantial or overt manner. Story one is "Gambling Man", and features Sam Lee as deadbeat mahjong player Kan Au. Even though he's heavily in debt, Kan continues to gamble, and his debt is growing ever larger. His luck changes when he comes into possession of a lucky coin that grants him the ability to pull the "13 Unique Wonders" (an insane winning hand in mahjong) a total of 13 times. The problem is he can only win once per day, and each win usually comes with someone's untimely death. Can he make enough at the mahjong table to pay off his massive debt before the pile of corpses starts to bother him? As usual, Sam Lee is a fun performer, and "Gambling Man" manages a few moments of tension or cleverness. However, the segment is rather predictable, and feels not unlike one of the minor segments you'd find in a Troublesome Night film - with the added caveat of a lot more gore. scare 2 die seems to take pleasure in serving up fleshy red bits whenever it has the chance, though not to a truly Category III level. The make-up effects are usually too fake or too disconnected to scare or unnerve, and without a really interesting story, the lasting effect is one of mild diversion. But hey, gore is gore. Get it while you can. Segment two, titled "Running Girl", amps the gore because it has the perfect reason to. Elanne Kong stars as a girl who wakes up, puts on a red button-up shirt and no pants (yow!) and proceeds to find out that everyone in her nearby vicinity has become a flesh-eating zombie. Or at least, they're probably zombies. The film doesn't really tell us if they are but they pretty much have to be, because why else would everyone in her housing estate become grey-skinned flesh-eaters? Obviously perturbed, Elanne runs all over the estate in fear while people chase her trying to eat her heart. Eventually she strikes back by picking up an axe, though there may be far too many zombies for her to take down. Elanne Kong is a petite young woman. Cub Chien starts "Running Girl" with a quick montage of shock images and quick cuts, relating the entire segment in a fast and confusing manner. Then, the whole segment unfolds again normally, with the story related via normal storytelling. This uncommon technique helps make the segment far more interesting than it should be because the audience spends their time piecing together the story based on the opening montage, matching previous images to actual onscreen development. The worst thing is that the story is hardly substantial in montage or non-montage form, as it's nothing more than a common horror situation given physical, visceral form. "Running Girl" is entertaining enough on a technical level, as Chien keeps the adrenaline and blood pumping for the segment's full running time. However, the segment suffers from possible omission. scare 2 die's released promotional stills reveal many details and images from the segment that never appear in the final cut of the film. Maybe it was all excised to secure a more teen-friendly Category IIB rating, but the photos hint at stuff that was probably a little more disturbing than the segment's current content. Still, Elanne Kong is a fetching horror victim, and Cub Chien gets plenty of mileage out of her twitchy eyes and long, dark hair. After all, what's an Asian horror film without long, dark hair? Story three is "Dying Boy", and features Tommy Yuen as a slacker who signs up to be in a reality show called Hak Sei Nei or "scare you to death" (trivia: this is also the Chinese title of the film). Then, scary stuff starts happening to him left and right, which he believes must be the reality show people messing with him. Meanwhile, he returns home to his grandfather and encounters more potential frights, most having to do with Chinese cultural traditions, which means it may not make total sense to everyone who tunes in. Then again, the segment may not make that much sense anyway, because it abandons logic for a continuing parade of horror film technique. Oddly, the last segment may actually be the most haunting because it references actual Chinese customs and superstition, and takes place in a genuinely scary place that doesn't need much maniuplation to appear scarier. Anybody can freak out people in a hospital bathed in blood, but actual rundown Hong Kong housing estates are downright creepy with the right lighting or camera angles. Add in an appearance by Hau Woon-Ling (the scary old lady from ten trillion Hong Kong movies), and some decent cinematography and lighting, and you have a half-hour that's more interesting than actually boring - though the ratio of interest to boredom is debatable. It may all depend on how frightening one finds Chinese superstitions and empty housing estates.